The Canmore Quad. Oh. La. La. A quick glance at the Fastest Known Time website reveals that FKT routes are to be found in all corners of the world. Kilian Jornet’s “summits of my life” project is possibly the most systematic attempt to establish FKTs for the ascent and descent of “some of the most important mountains on the planet”, including Mont Blanc, the Matterhorn, Mount McKinley, Acongagua and Everest. For the truly masochistic, there’s also the possibility/insanity of doing the double – as recently completed in July 2018 by Jeremie Philibert with a time of 25 hours and 49 minutes. The current FKT for “just” the single was set by Ryan Atkins on 3 September 2015 (announced on Facebook), an incredible 9 hours 14 minutes, beating his previous time of 9.19 set in August 2014. This is a truly monumental effort but those that came before him were hardly taking it easy. Ernst Salzgeber, approximately 17 hours, date unknown, at the spritely age of 60! Designated start: In Canmore, the Triple Crown hiking challenge (Ha Ling, Lady Mac and EEOR) starts and finishes at the historic Georgetown Inn. The Quad has started and finished in different locations but for consistency (and to avoid distance arguments), should also start and finish at the Georgetown Inn. Time Keeping: While it’s important to track your own progress, there should be independent time keeping as well. Starting at the Georgetown Inn allows for this, as the clerk can record start and finish time. This also resolves the issue of forgetting to turn-off auto-stop features on watches, or rechargeable GPS watch batteries dying mid-attempt. Running Time: All FKT attempts should have a running time where the clock starts when they leave the Inn, and stops when they return. No time credits for bad weather, lunch breaks, etc. Support: Athletes can perform better if they have friends or family providing support, such as food/drink refills, or even pacing duties, so planning to receive aid or support is encouraged. Route: Ultimately, the FKTs come down to reaching each summit and ideally, taking a summit photo (always including a summit feature if one is present). The order of mountains summited doesn’t need to be fixed, but for consistency, athletes should try to travel on the main trails/paths as much as possible, although in the mountains, and especially above treeline, this is not always clear. Straight lining descents, or taking short cuts does not fit with the spirit of the challenge and should be avoided. GPS and Watches: GPS watches do a great job of recording your GPS track, altitude, etc. For the most part, they seem to hold a pretty accurate track, and will offer route guidance for future challengers. GPS tracks also provide another layer of support for the accomplishment. 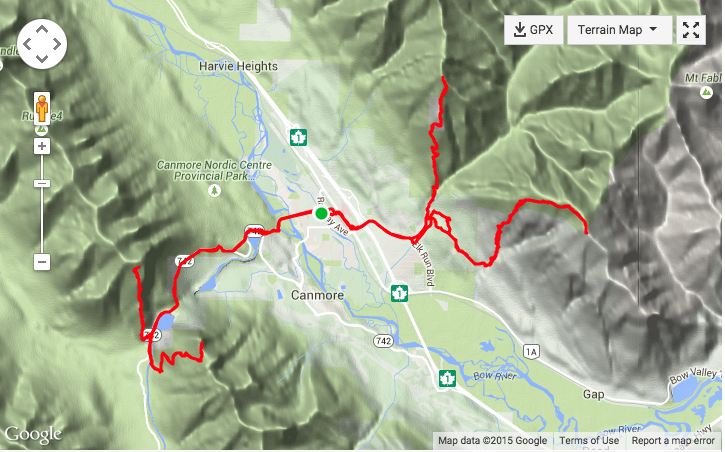 So, is the Canmore Quad in my running future? I know I wouldn’t stand a chance of coming close to some of the more recent times for this, let alone the FKT. The “slowest known time” perhaps, but certainly not the fastest. But does that put me off? It certainly doesn’t lessen the appeal of taking on this particular challenge. Merely finishing would be a massive accomplishment by any standard. And seeing these four peaks every day, towering over Canmore, it’s almost as if they are taunting me to have a go. I think I might. And if and when I do, you’ll read about it here on Canmore Runner. Yes- what a cool adventure! I finally got out and completed it today. I was unable to rely on the Georgetown staff – they had no clue what I was talking about. So alas my phone became my evidence 🙂 But it was a glorious adventure! Wow, congratulations. Excellent day for it. Breezy summits no doubt. How long did it take you? For the record, Jack Firth also completed the quad at 60, he actually did it for his 60th birthday. Hi Jan. incredible effort. Thanks for letting me know. Seems I need to update the blog! Had a slow time with the altitude living at sea level and being off with an injury the last month but managed to get it done yesterday. Luckily I had perfect conditions and I had heaps of fun!